Well, it’s September, and I hope your summer was most enjoyable. Personally, I love having up to 15 hours of “Let there be light.” The Word of God shows us that He relates to us according to a linear timeline, and thus we know that He and the Lord Jesus are marking time together with us as the opportunities of our lives come and go. Our Father and our Lord flank us in the trenches of life, ever abiding to help us maximize those opportunities to do their will and glorify them. 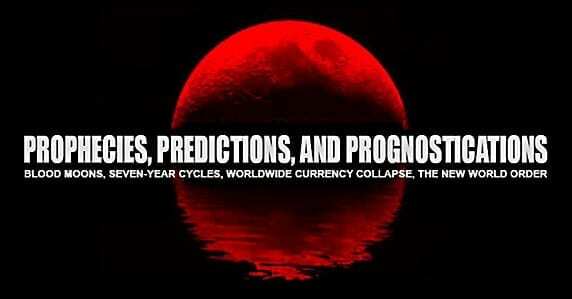 As time ticks by, we are increasingly bombarded with “prophecies,” predictions, and prognostications about Jewish holy days, blood moons, seven-year cycles (one of which ends this month), a worldwide currency collapse, the New World Order, and a variety of dates for the supposed fulfillment of biblical events like the Return of Christ, though most do not delineate between his coming IN THE AIR FOR THE CHURCH (the “Rapture”) and his subsequent coming IN THE LAND TO ISRAEL (the Resurrection of the Just). Some say that prophecies from Isaiah 9 have come to pass in 2001ff, and that more Old Testament prophecies, as in Isaiah 24, are about to be fulfilled this Fall. Others have apparently misread Titus 2:13 (coming up in this letter) and are looking for the blessed Pope, who is coming to the USA this month to speak to our Congress and the United Nations. The Internet is abuzz with predictions of dire events occurring this month and next. The big question is: Will there even be a World Series? Of course, as the saying goes, “Time will tell,” but in the meantime, THE WORD OF GOD tells us much more than most Christians realize. If you have never (or not recently) seen our exciting eight-segment, 5.5-hour video titled The End Times, please do so, as it may well clarify some of these things for you. It precisely lays out what the Word written TO CHRISTIANS says about what lies ahead for us, and what the Word written TO biblical ISRAEL says about their future. For the record, the “Israel” formed in 1948 by the United Nations, whose motives and actions are highly suspect, is in no way the biblical Israel spoken of in prophecy, as most Christians believe. The End Times is a stirring exposition of the oft-misunderstood and indispensable Administrations in Scripture, followed by a verse-by-verse journey through all of 1 & 2 Thessalonians, which shows these vital truths in black-and-white. Here is one of my favorite verses, and not just because it is easy to memorize—or decoupage. Talk about a succinct formula for powerful Christian living—wow! The JOY of our HOPE can supersede all the horrors in the world around us, if we choose to focus on seeing our Lord Jesus face-to-face and receiving the rewards he will give us for serving in his stead. Doing so helps us to “stay put” under pressure of any degree. And through it all we pour out our hearts to our Father and our Lord, expecting to see them respond to our petitions. Understanding what God and Christ have done for us is key to doing all we can for them (2 Cor. 5:14-15; 1 John 4:19). Rather than giving us a license to sin, grasping the magnitude of God’s grace (undeserved favor) motivates us to “Just Say No” to ungodliness and to say YES!!! to zealously doing the good works that the Lord Jesus has for us as his representatives on earth until he rescues us from this present evil age. 11 For the grace of God has appeared, bringing salvation to all men, 12 instructing us to deny ungodliness and worldly desires and to live sensibly, righteously and godly in the present age, 13 looking for the blessed hope and the appearing of the glory of our great God and Savior, Christ Jesus, 14 who gave Himself for us to redeem us from every lawless deed, and to purify unto Himself a people for His own possession, zealous for good deeds. A great biblical truth is that our redemption is both FROM and UNTO. God has redeemed (“to buy back, as after a mortgage foreclosure”) us FROM the Devil’s clutches by the precious blood of His Son. He has also redeemed us UNTO the unique ministry each of us has in Christ. Unable to make the payments of righteousness, we were foreclosed upon by Satan, who had no intention of fixing us up. But the Ultimate State of Reality Developer, Jesus Christ, came along, bought us for the highest possible price, and is turning us into beautiful dwellings for his spirit. The following verses again show the FROM and UNTO theme. 3 For we ourselves were also once foolish, disobedient, deceived, serving various lusts and pleasures, living in malice and envy, hateful and hating one another. 4 But when the kindness and the love of God our Savior toward man appeared, 5 not by works of righteousness which we have done, but according to His mercy He saved us, through the washing of regeneration and renewing of holy spirit, 6 which He poured out on us abundantly through Jesus Christ our Savior, 7 that having been justified by His grace we should become heirs according to the hope of eternal life. 8 This is a faithful saying, and these things I want you to affirm constantly, that those who have believed in God should be careful tomaintain good works. These things are good and profitable to men. How did Jesus do it?! I assert that one key is found in Psalm 40, hard on the heels of the fabulous Messianic prophecy in verses 6-10. Verse 11b says: “Let your love and your truth continually preserve me.” Jesus never wavered in his boundless assurance that he was BELOVED BY GOD, his Father. And he so internalized, and lived, the truth of the written Word that he never doubted his ultimate destiny. Let us do likewise, cleaving unto God’s love and truth. And, as we should do, he focused on the hope that was set before him. 13 It is written: “I believed; therefore I have spoken.” Since we have that same spirit of faith, we also believe and therefore speak, 14 because we know that the one who raised the Lord Jesus from the dead will also raise us with Jesus and present us with you to himself. 15 All this is for your benefit, so that the grace that is reaching more and more people may cause thanksgiving to overflow to the glory of God. 16 Therefore we do not lose heart. Though outwardly we are wasting away, yet inwardly we are being renewed day by day. 17 For our light and momentary troubles are achieving for us an eternal glory that far outweighs them all. 18 So we fix our eyes not on what is seen, but on what is unseen, since what is seen is temporary, but what is unseen is eternal.